A must have to drill or chip concrete and block. Works just as good as my corded Hilti Te5 drill !!! With out a doubt this tool pays for its self. I build mini storage buildings and there are many occasions where this comes in handy. i may have to run out 300 feet of cord to drill 1 hole that was missed for example. I've never used any other brand cordless rotary hammer drill. And after using this one, I never will. 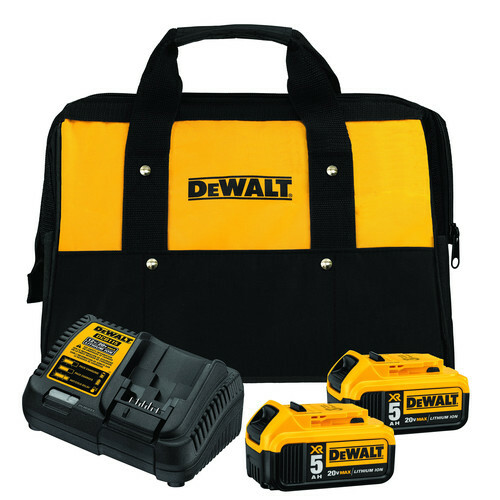 I use dewalt 6 ah battery with it. I'm a master electrician and this item is very useful, powerful, and reliable. I would recommend it to anyone in the trades. Worth it at twice the price! Performs flawlessly. Brushless motor is easy on batteries. Have used similar u n it from Hilti but that one came with a $1700 price tag. Very good comprimise for having to haul a generator for smaller demo jobs. Very handy tool! Works especially well for tapcons and the like. Larger holes do wear the battery down faster, but still incredibly useful when a corded tool is not an option. I use it nearly every day on the jobsite and it's the second one I've bought now and will likely buy another one when this one wears out. Two thumbs up for sure! This thing is a BEAST! I didn't want to fork over the big bucks for 2-3 days of a demolition hammer rental, so bought this instead. I used it HARD for two days knocking down 10" cement deck footings. Definitely asked more from this SDS+ than it was designed for, but it kept on chugging and got the job done. I would have paid the same money to rent a demo hammer for a couple days as I did to buy this! It did leak a bit of oil out the chuck for a bit at first when it got hot, but that is to be expected when expansion occurs under force of heat. I have other brushless 20v Max tools, so know how good they are at efficiently using battery power. That said, with such a beefy tool, and asking so much of it, I was really surprised at how long the 5ah batteries lasted. Tool still defective. Need to return. Tool does not work well. It intermittently runs. This tool is amazing!! It's just as strong as my $400 Bosch corded hammer drill but it's smaller and utilizes lithium batteries. I use it to drill holes for anchoring gate operators and plated posts. I don't k i.e. if ill ever use my Bosch again haha. Best purchase this year!! I use this tool nearly every day, has just as much power as my corded dewalt hammer drill but without the pain of needing a ply in near by. I should have bought one earlier. Can i use the 60 vl battery in this tool? lithium Battery 18v can be use for this product ? What kinds of bit heads work in this tool? For drilling specifically, hex seems not to fit. BEST ANSWER: You must use SDS type bits, chisels, etc.